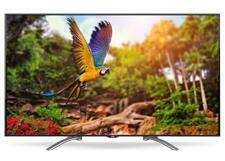 AmTRAN will introduce an 85-inch JVC-branded Ultra HD TV to the marketplace in January, with an MSRP of $7,999. The new Diamond Series DM85UXR will use a direct LED backlighting system with 64 zones of local dimming and CrystalMotion Pro technology to reduce motion blur. It also comes with a Roku Stick, built-in WiFi, and a remote with a full QWERTY keyboard. AmTRAN Video Corp. has announced that the new JVC-TV Diamond Series Ultra HD 85-inch DM85UXR (SRP: $7,999) will ship in January. The 85" screen size is JVC-TV's largest and features Ultra High Definition, with roughly four times the resolution of a Full HDTV. The 85" screen, which takes optimal advantage of UHD capabilities, will redefine "home theater" expectations. The DM85UXR comes packaged with the immensely popular Roku Streaming Stick (Roku Ready Version), which instantly unlocks a new universe of streaming content, with over 1,500 channels to choose from. Appropriate for any home or commercial décor, the DM85UXR is crafted with JVC's signature, aesthetically pleasing slim bezel design. The Ultra HD (4K) display incorporates direct LED backlight and 10-bit color, an innovation that greatly enhances dynamic contrast, delivering the most precise color reproduction on the market. This is made possible by an unrivaled 64 zones of local dimming, which dynamically adjusts backlighting scene-by-scene to assure the deep blacks and brilliant details of today's digital content. Even the most devoted HDTV fans are continually astounded by UHD's 3840 x 2160 resolution and incomparable picture quality. And the DM85UXR has a number of other valuable innovations to maximize the user/viewer experience. These include built-in Wi-Fi for seamless web surfing and a handy double-sided remote with a full QWERTY keypad, enabling much faster text searches than common virtual keypads. At the heart of the DM85UXR is JVC-TV's ground-breaking UHD upscaling technology. This innovation bridges the current gap in high-definition content, boosting standard HDTV picture dynamics to closely match true UHD images. This is a major benefit of the DM85UXR, as it allows consumers to continue to enjoy their favorite programs in near-UHD quality, regardless of a program's native resolution. Parallel advancements that make UHD even more desirable include JVC-TV's CrystalMotion Pro technology, delivering 240 scenes per second for crisp, fast motion images with magnificent clarity. This is further enhanced by JVC-TV's CrystalColor XD and 50 million-to-one dynamic contrast ratio delivering brilliant colors, stunningly sharp images, and lifelike pictures for a mind-boggling viewing experience. To complete the home theater experience, the DM85UXR features a 60-watt (15 watts X four) XinemaSound 3D system. Representing a true evolution in built-in TV speaker audio, XinemaSound 3D offers a level of acoustic modeling and digital signal processing previously heard only with elaborate outboard speaker arrays. Popular capabilities like HDMI (four 2.0 w/HDCP 2.2; one 1.4) control round out the robust feature set on the DM85UXR. The unit's Consumer Electronics Control (CEC) gives consumers control of up to 15 CEC-compatible HDMI devices, including the popular Roku Streaming Stick. • JVC TV Delivers First Ultra HDTV at HomeTheaterReview.com. • JVC EM55FTR LCD HDTV Reviewed at HomeTheaterReview.com.